» Long live this library! 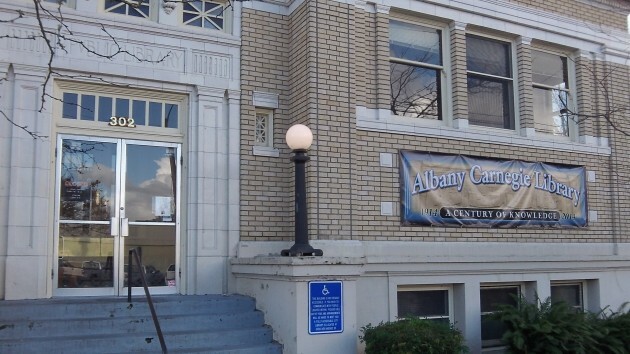 It’s a big anniversary for Albany’s Carnegie Library. It’s Albany’s downtown Carnegie Library on Ferry Street, which was dedicated in 1914 and this year is celebrating a century of continuous service to people who read and children who want to learn. And what a service it is! Nothing overcomes the fate of being stuck in one place as much as reading about the world, in fiction as well as fact. And the public library makes this possible at small or no additional cost to the individual reader. The Carnegie Library is not the biggest or the busiest around. The main library on 14th Avenue is vastly bigger and busier. But the downtown branch is especially appealing because of its intimate size, historic feel, and close proximity to thousands of people in west, central and north Albany. Not to mention the old radiators that keep the interior cozy on cold winter days. And with nearly 23,000 titles, it has enough material and a varied enough selection that even regular customers will never run out of something to read. In budget discussions over the years, I’ve heard members of the city council and others say that nothing is as important as providing for public safety. By this they mean that they will always want to fund law enforcement first even at the cost of other services. That is too narrow a view. A town without decent libraries — or parks for that matter — would be just as unlivable as a town with too much crime. The government did not invent the library. They were here before government came along and they will be here after government goes away. The internet has negated the need for physical libraries. They are dinosaurs on their way to extinction. Given that technology has negated their value they have become quasi homeless shelters and babysitting services, less fountains of knowledge. I’d rather the property tax that funds this “service” go towards something more essential. How well I remember the anticipation of visiting that library, wending my way through and down to the kids’ section. And a look at my local crowded library tells me that libraries are in no way dinosaurs! Ours is always teeming with people using it in ways we never thought of (including to access the internet). I am an avid user of the library on 14th. Living in Millersburg, I have to pay for the privilege but I am reimbursed nearly 100% by the city. One of my first memories of going to the library was when my family lived in Eagle Point, Oregon. I couldn’t have been much older than 7 or 8. My older siblings and I were allowed to walk down the railroad track, probably several miles, to go to the library. I learned to read from homemade flash cards when I was 4 and have been reading ever since! Jim, I don’t disagree with your general premise of your viewpoint. I think where we differ is – should library services be provided by city government through the property tax? Users like yourself, Hasso, and others on this blog clearly seem to be willing to pay for a library service, but only if government forces non-users like myself into making this service available to you. In my ideal world a library would stand on its own two privately owned feet – no government coercion involved. I consider libraries a step above city parks in necessity. Would you want a city without ANY parks? How many of us “older folk” spent hours at the library doing research for various “theme” papers, essays etc. while attending school? My parents couldn’t afford a set of encyclopedias etc. There is also a “social aspect”, where friends can meet friends that share common interests without getting wet.